Be one of the first to choose your luxury waterfront 1, 2, 3 & 4 bedroom apartment in the Meraas Bluewaters Island. The home of the Ain the world’s largest Observation Wheel. Very prime location near Jumeirah Beach Residence. Because it’s right on the beach. Bluewaters residences comprises 10 apartment buildings, 4 penthouses, and 17 townhouses. 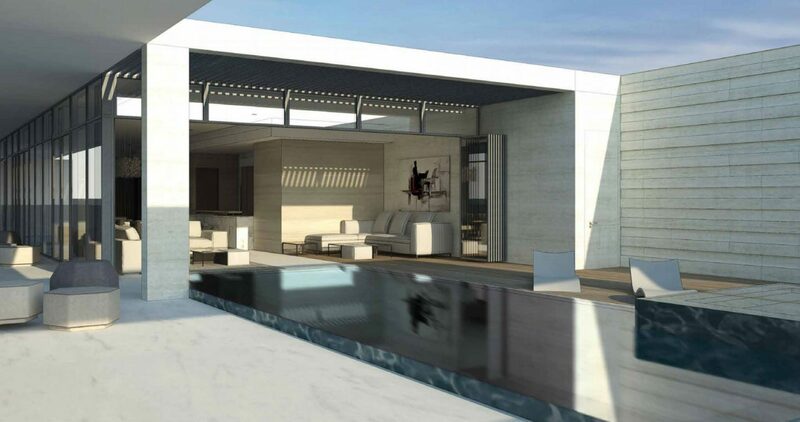 Properties offer a range of dimensions and are set over a podium that is aligned to capture stunning views and create a truly unique island experience. The elegant, mid-rise towers are home to 698 one, two, three and four-bedroom, glass-fronted apartments, each with one or two parking spaces. Bluewaters offers a premium lifestyle for the whole family with residential amenities including state-of-the-art gymnasiums, swimming pools, landscaped gardens, basketball courts and children’s play areas. Bluewaters Residences comprises 10 residential buildings, 4 penthouses, and 17 townhouses. Properties offer a range of dimensions and are set over a podium that is aligned to capture stunning views and create a truly unique island experience. The elegant, mid-rise towers are home to 698 one, two, three and four-bedroom, glass-fronted apartments, each with one or two parking spaces. Bluewaters offers a premium lifestyle for the whole family with residential amenities including state-of-the-art gymnasiums, swimming pools, landscaped gardens, basketball courts and children’s play areas. 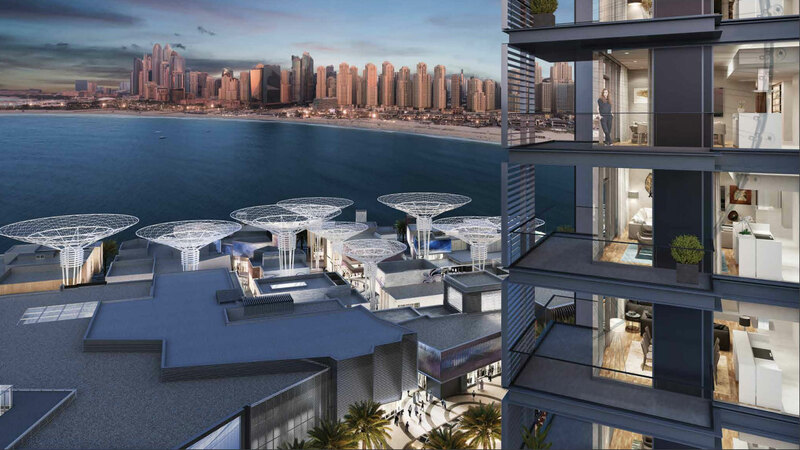 Bluewaters is within touching distance of Dubai Marina and is just a short drive from Abu Dhabi. 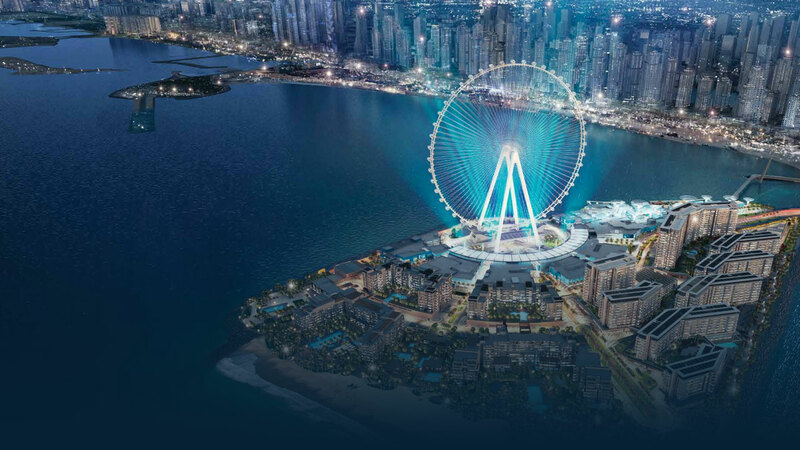 Connected to the mainland by a direct road link from Sheikh Zayed Road, Bluewaters will operate the Group Rapid Transit service that offers passengers a unique travel experience via a driver less vehicle system. 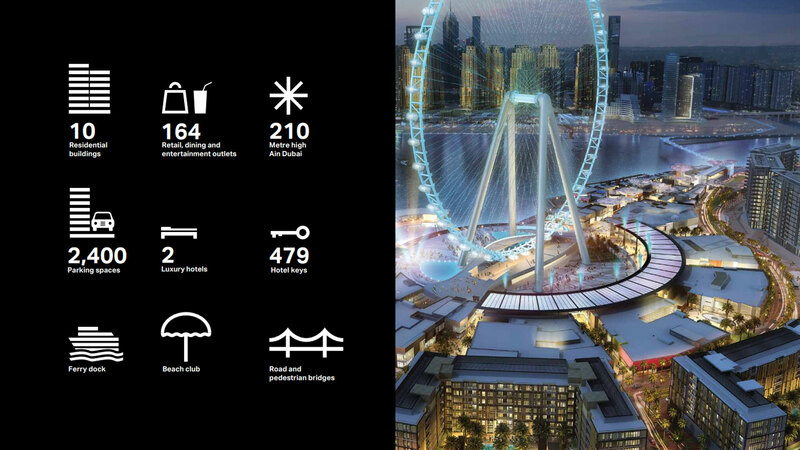 There will also be a 265 metre pedestrian bridge linking the island to the beachfront at Jumeirah Beach Residence. The two, five-star, luxury hotels at Bluewaters are set to become a magnet for visitors from around the world, ensuring there’s a place for everyone on the island. Set at the tip of the island with breathtaking views of the sea, the hotels command a premium position in Dubai. Their architecture is a low-lying haven for those looking for a seafront retreat. The hotels will have relaxing beach club and distinct dining offerings that cater to the most discerning guests and visitors. 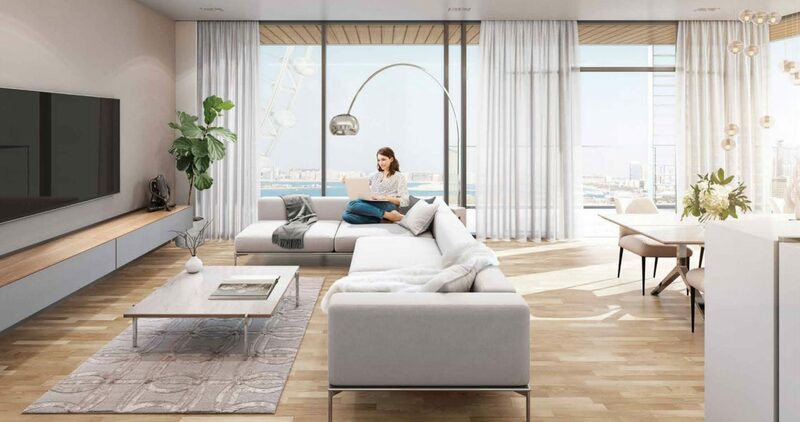 Bluewaters is a destination with a pioneering spirit, blending waterfront living with the exhilaration of the city to create an unrivaled experience for residents and visitors. The island represents a colorful beacon adorning Dubai’s urban landscape, drawing in those seeking endless lifestyle opportunities. 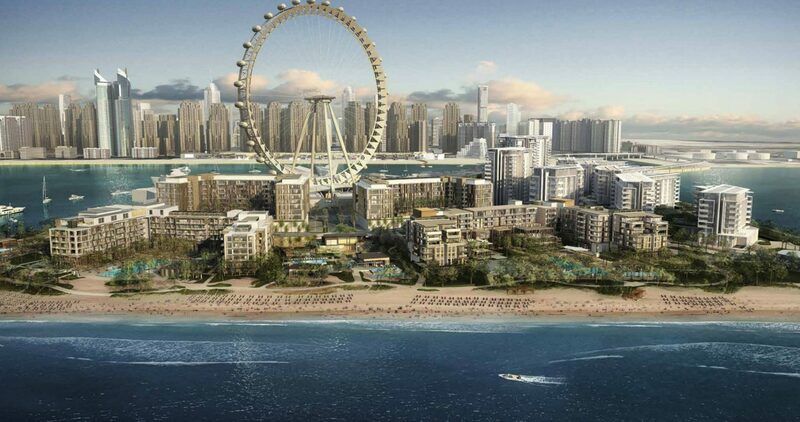 Located off the coast of Jumeirah Beach Residence opposite The Beach, Blue-waters is home to Ain Dubai, the world’s largest observation wheel, and the first Caesars Palace hotels in the Middle East. 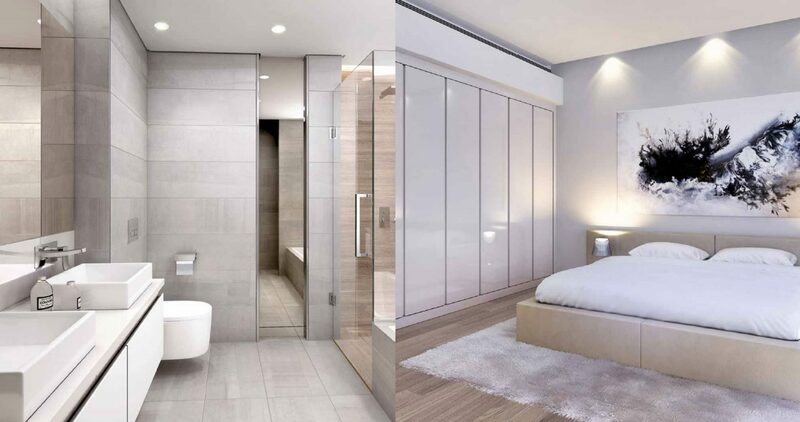 The interiors at Blue-waters residences are finished to the highest standards, with a neutral palette and a minimalist style that combines the warmth of Scandinavian wooden floors with the opulence of soft metallic fixtures.